But the idea of building up an image from individual letters and other characters is much older than the computer. Here are three examples from our collections. 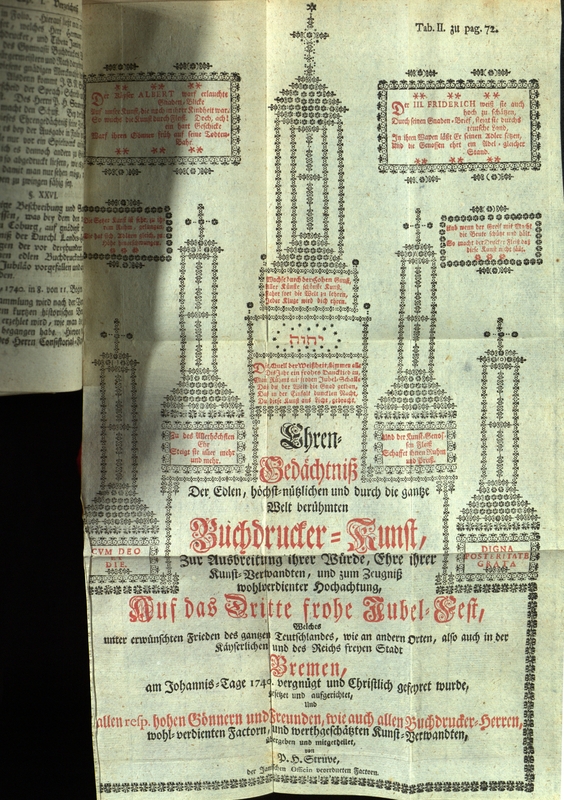 If you look closely, you’ll notice that in this case the method of illustration is not engraving; instead the image is composed (literally) entirely of typographical ornaments. That means that every section of every line is probably the imprint of a single piece of type. 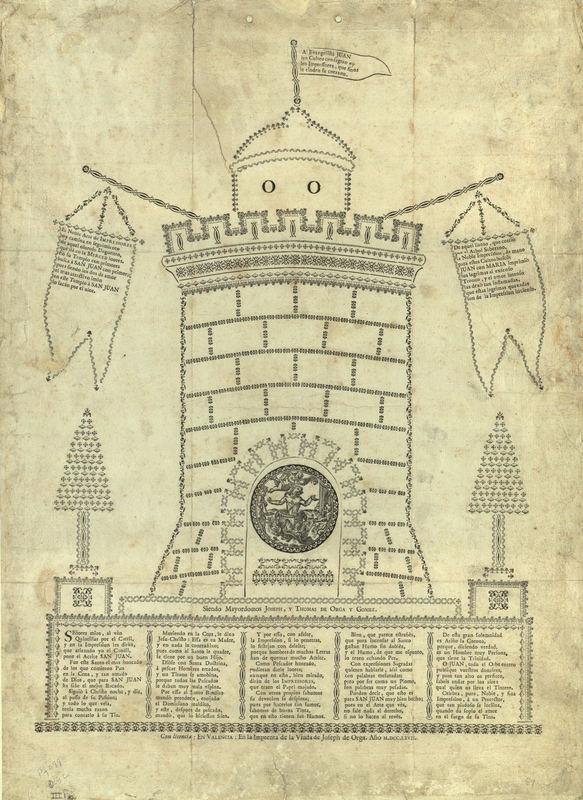 This Spanish broadside, printed in Valencia, dates from slightly later in the century but it follows the same principle. The most clever touch, in my opinion, is the use of two “O”s for windows in the upper area of the tower. I think my favorite detail here is the representation of the type on the press bed—backward and upside-down—and it’s corresponding impression—right-side-up and legible**—on the paper on the tympan. 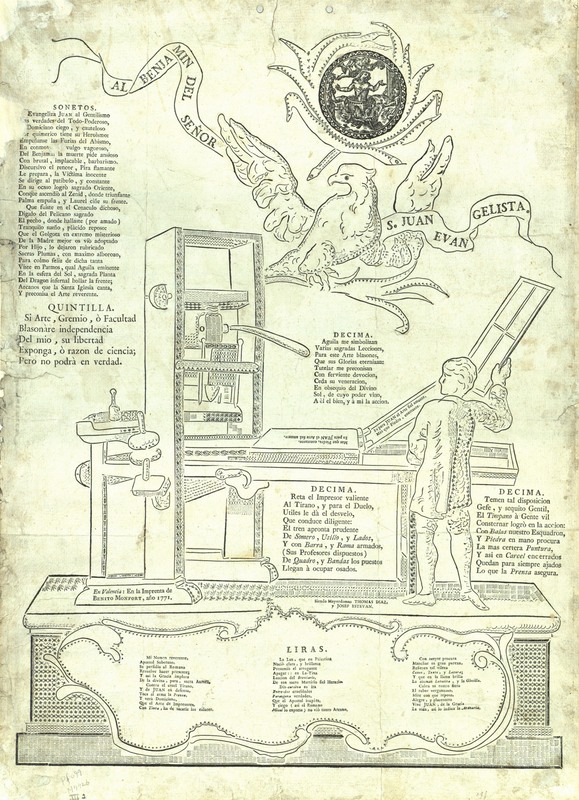 You can find more images of products of the two Valencian presses at the excellent Biblioteca Valenciana Digital site. * José Enrique Serrano y Morales’s history of Valencian printing, Reseña histórica en forma de diccionario de las imprentas que han existido en Valencia… (1899), p. 332 ff. (available in Special Collections or through Google Books). ** Technically, the type on the press bed should have just been backward, not upside down. This entry was posted in Updike Collection and tagged 18th century, ascii art, printing, Spanish, typography by Jordan Goffin. Bookmark the permalink. Pingback: Links.Historische 05/05/2011 at Links. Historische. A great re-use of the Benito Monfort image is available on Flickr: http://www.flickr.com/photos/daniel-rehn/5685891302/. An image originally printed (18th century) is scanned and put online (2011), printed on relatively antiquated (c. 1980s) dot-matrix technology, and then photographed and put back online (2011 again). Looks great!! IRemember some of those early games.